The freshly leaked Microsoft Band is now official and will work with iOS, Android, and Windows Phone devices. Redmond’s wearable device is made for the right hand, packs ten sensors, and will cost $199 when it hits the shelves on October 30 online and in Microsoft stores in the United States. Microsoft Band’s sensors allow it to measure heart rate, stress levels, and UV exposure among others. Available in three sizes, the device has built-in GPS, which allows runners to keep track of their workout without a phone. Its dual 100mAh batteries can power it for as much as 48 hours between charges. Users will read data and mobile notifications on a 1.4” TFT touchscreen with a resolution of 310 x 102 pixels. Device connectivity will take place over Bluetooth 4.0 LE. Microsoft Band is dust and splash resistant. Microsoft Health is a new cloud-based service that will debut alongside the wearable device. It stores data provided by Microsoft Band and provides users with actionable advices via an intelligence engine. 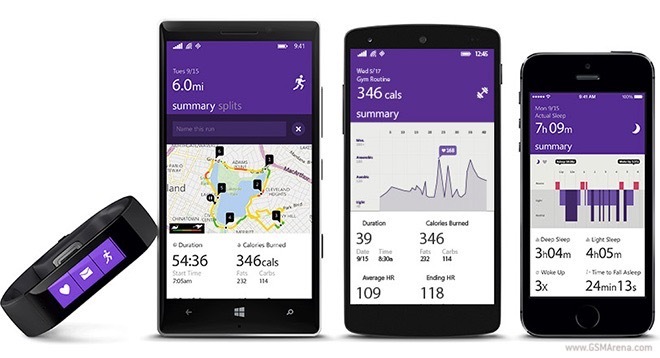 Microsoft Health will be open to other to other fitness platforms. UP by Jawbone, RunKeeper, MapMyFitness, and MyFitnessPal have already signed up for it. The company hopes to extend the number of partners and make Microsoft Health a major platform in the health tracking field. Check out the official Microsoft Band promo video below. The wearable gadget will be available in limited quantities at launch. There is no word on international sales just yet.